So you've figured out some fantastic ways to generate leads and they're coming into your database in droves — that's great. Unfortunately for you, they're probably not converting. According to Invespcro, 80% of new leads never translate to sales, regardless of how good your lead generation strategy is. As a marketer, it's up to you to change that. And automated lead nurturing is the answer. Businesses that use marketing automation to nurture prospects experience a 451% uplift in qualified leads (Annuitas Group) and companies that excel at lead nurturing generate 50% more sales-ready leads at a 33% lower cost (Forrester Research). Long story short, lead nurturing works. So here are 7 lead nurturing emails from some of the best in the industry. As a Saas Company, feature launches are the perfect excuse to reach out to customers. And for the majority of customers, it's welcome news — 60% of people are more likely to seek out a product after reading content about its features (Kapost). Highlighting a feature release gives your audience a reason to look into your product in more detail — especially if it's solving a pain point. 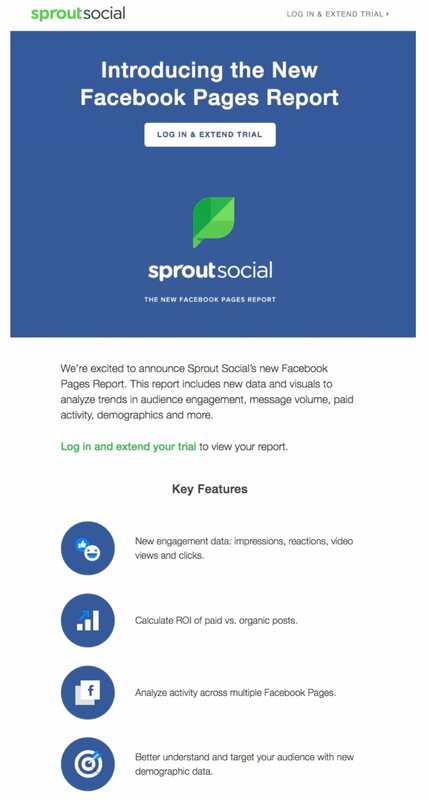 In Sprout Social's case, it's a fantastic way to get in touch with trialists and cold leads. Reminder emails can be rough to execute. The balance between timing, frequency, and content-quality is tricky: you want to keep your customers in the loop without annoying them to death. As far as content goes, TheZebra hits the nail on the head with this email — direct, to the point, and most of all, useful. A reminder is no good unless it's providing the recipient with value. Learn how to get the timing right on a nurturing email like this one from TheZebra. Typeform: the "I miss you"
In the SaaS world, sometimes users drop away and start churning. Very sad stuff. 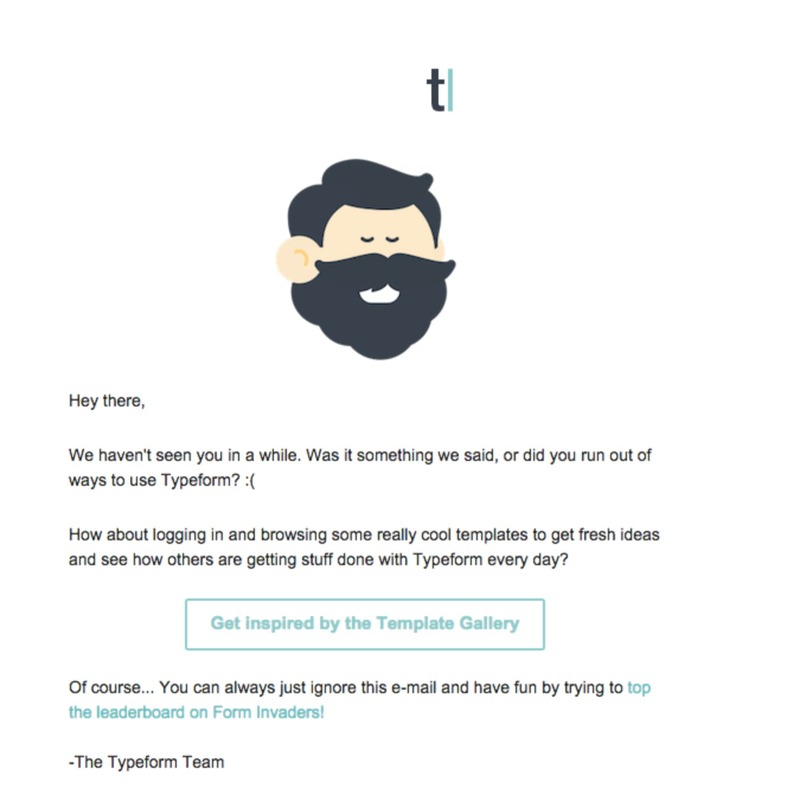 When this happens to Typeform, they handle it tactfully with an earnestly written email. They don't ask too much of their users here. Just a simple nudge towards the template gallery and a fun game. 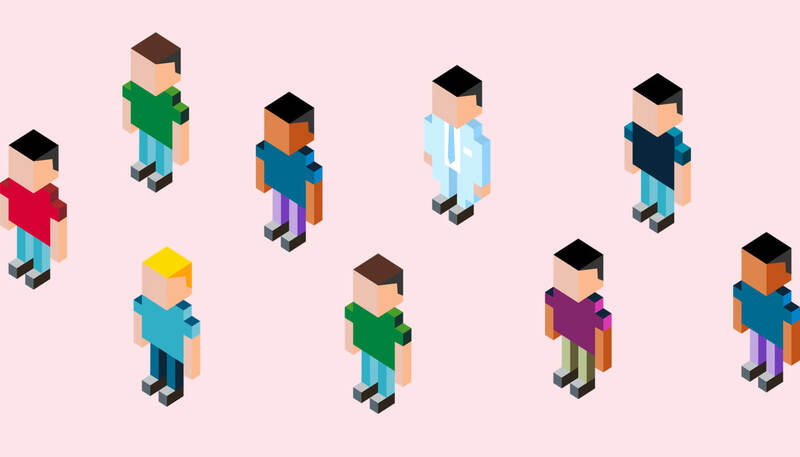 You may ask yourself how Typeform knows when individual users are at risk of churning. Well, it's actually not too complicated — it would look just like the journey below, except with an email action added in. The Smart Segment trigger is the key, introducing users into the journey when they have met certain conditions (e.g. not logged in for a month). 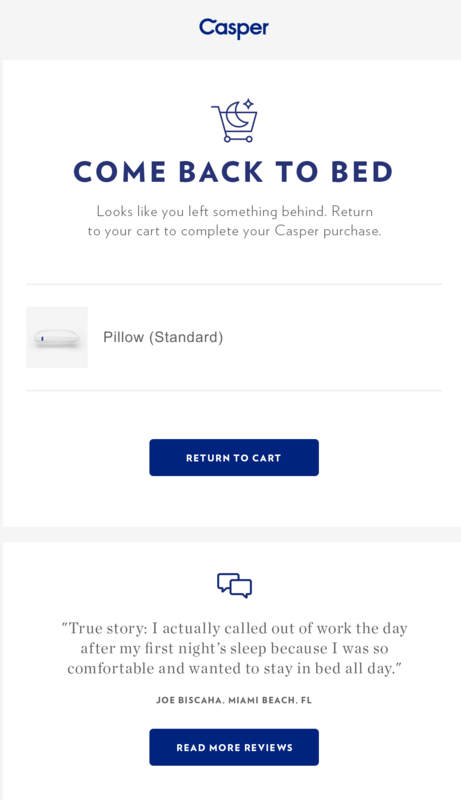 An elegant approach to the abandoned cart email, Casper doesn't distract you with anything but the essentials. Bold font choice, great design, and clever copy make this email striking to the eye without needing to rely on imagery. The review is a nice touch, too. You can create abandoned cart emails like this one with the Segment integration in Autopilot. 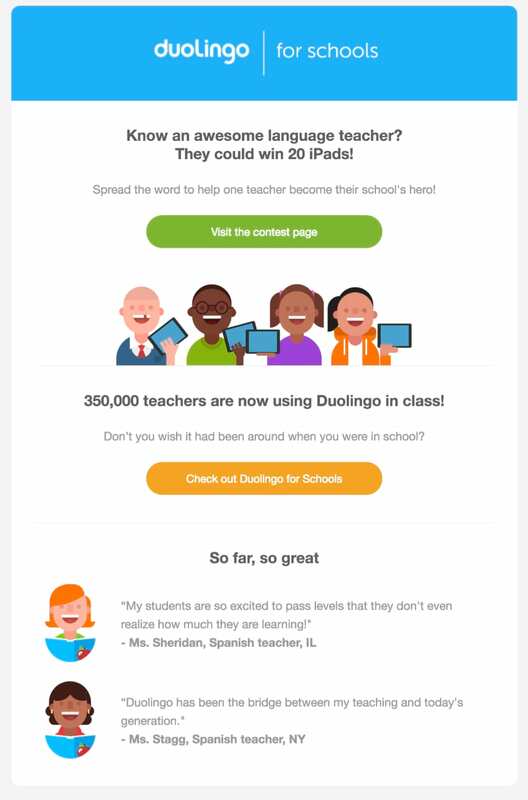 Duolingo reached out to students with a highly engaging and targeted email. This is a great way to engage an audience twofold: once with the original recipient, and a second time when teachers are nominated. Note the two CTAs: each is focused on separate behaviors, without diluting one another. With a few testimonials sprinkled in for good measure, emails like this are sure to get people clicking. Great design. 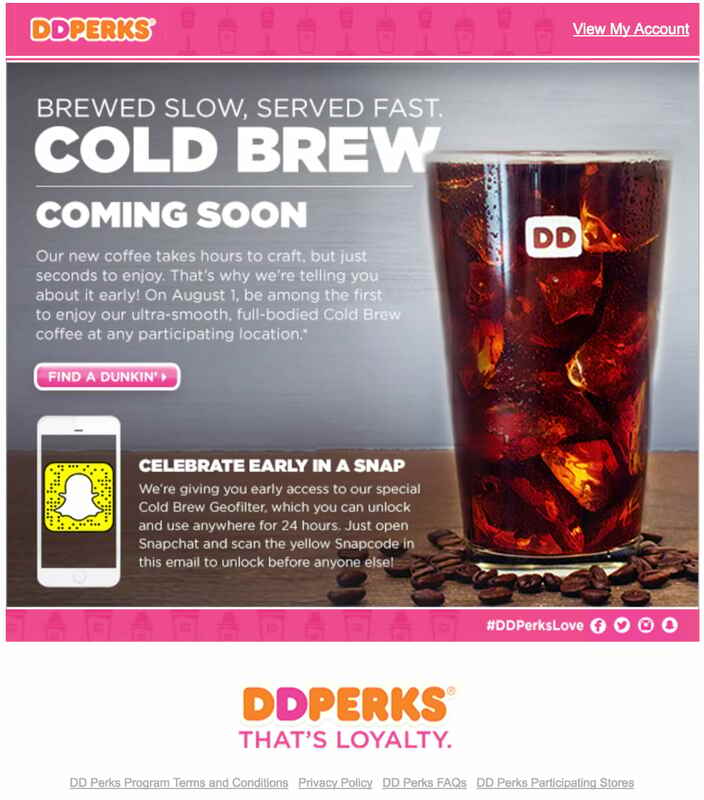 Dunkin Donuts used a new product launch to tie current customers into other channels. Simple, yet effective, the "early access" email was sent to entice sales of the new coffee. The condition to get in first? Scan a Snapchat QR code and "celebrate early." Driving users to social channels and to storefronts at the same time: that's a win-win if I ever saw one. Find out more about marketing with Snapchat. 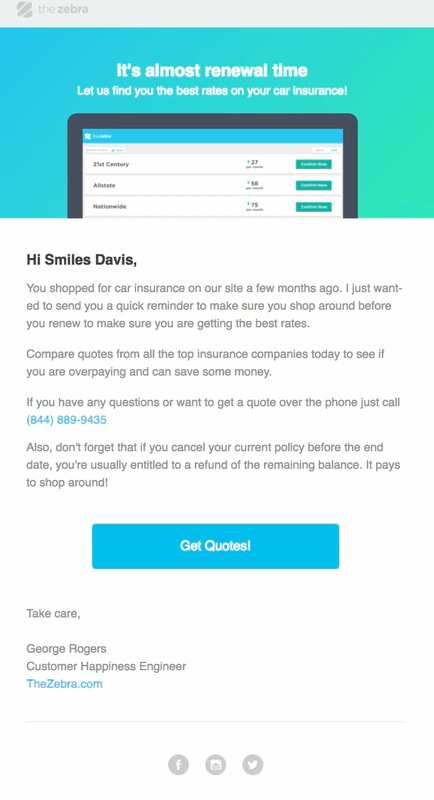 This email from LiveChat is a great example of how a lead nurturing email can bring design and personalization together into a beautiful mix. Addressing email recipients by their first names is a great way to start, but what's even better? Sending those recipients targeted content depending on who they are and what they're interested in. The best part? LiveChat use Autopilot for all their lead nurturing journeys. It's all possible through the Autopilot Tracking Code. This LiveChat email, among many others in the list, would feel right at home in a simple newsletter journey like this one. Or, for marketers looking for a more advanced approach, a lifecycle lead nurturing journey may do the trick. This is a specially designed journey that turns leads into paying customers by nurturing them through a content funnel. Check it out below. Marketing and sales teams that automate lead management see a 10% (or greater!) uplift in revenue over 6-9 months (Gartner Research). So why aren't you nurturing your leads right now?